Where the answer is almost always 42. Tonight Tasha and I had to say goodbye to our beloved dog, Teddy. Here’s what happened: two weeks ago, I came home late from a night out with my karate buddies and Teddy was laying in the kitchen looking stunned. He didn’t want to get up, but after some coaxing he went into the back yard and laid down. He didn’t want to get up from there, and I was worried about him but he came in, had a treat and some water, and then went to his normal position by the front door. The next morning, he seemed to be acting normally so we chalked it up to his phenobaribital drugged state and the late hour. Later in the week (last Wednesday) I went to the vet and they ran his normal battery of blood and levels test, they said his white cell count was a little high but they chalked that up to an ear infection and gave me meds. I explained the problem that we encountered a few days prior, and the vet prescribed some anti-inflammatory pain medicine for him to help his achy old hips. He responded fairly well to that medicine and was back to normal for a few days. The last couple days, he has been increasingly lethargic but would usually stand back up and head outside. He seemed fine this morning. Tasha told me that he laid in the kitchen in a dazed way, and it seemed like his breathing was a little more labored than usual. When I got home he continued to be this way, and I tried to pick him up to get him on his feet and he put forth no effort to stand or walk. He also refused food and water, except for a bowl of water we put near him when we went out for awhile. When we had come back, he had drank all the water and spit it back up. His breathing was getting more labored and he really didn’t want to move at all. I had called to get him a vet appointment tomorrow morning, but after seeing that he continued to be in bad shape we took him to the emergency vet clinic. Jessie and Jeremy Robertson came over to help watch Eve (who was asleep) and Jeremy had to help me carry Teddy out on a tarp since he wouldn’t walk on his own. The vet tech took him in to the surgery room to assess his condition, and the doctor came out within 15 minutes to tell us that they had found a good sized tumor on his spleen. They said that 2/3 of the time it turns out to be cancer, 1/3 of the time it doesn’t… but either way they’d have to remove his spleen which is a pretty major surgery. If he made it through the surgery, it would have only bought him about 30-60 days (most of that recovering from the surgery. The doctor said that he had blood in his abdomen, so the choice was either risky surgery for only a small amount of time, or we could let him go peacefully. We made the right choice for him, even though it was extremely painful for us. We got a chance to say a tearful goodbye, and I stayed with him while they administered the medicine. I remember the day we adopted that dog. He weighed in at around 117 lbs and looked more like a watermelon than a dog. He quickly took to life outside a crate, sleeping with Tasha and I most nights until his seizures made it hard for him to get up on the bed. He used to love the snow, and would bound around like a puppy whenever it snowed enough for him to do so. In recent years, bounding took the form of rolling face-first in the snow but he still loved it. He used to keep me, John, and Matthew company in the basement at night. He used to love his walks in the open space together, especially when Eve would come along with us. He was a good friend. He was great with Eve. We were lucky to have him in our life. I’m going to miss him, bad breath, gas and all. Wow, how fast time flies. The last few months have become a mix of houseguests, Church activities, and taking care of an active little girl. I’m about to start a long weekend, and I’m going to make up some lost ground on my guitar projects. I finally get the chance to use my new shop lights that my father-in-law helped me install. My hope is that I will be able to get the ribs of my acoustic guitar kit sanded down, the braces laid out, and some hide glue mixed up. If I can get through that much, I might try to figure out how to get some more done on my Les Paul projects. The summer is quickly speeding by… it is hard to believe that September is right around the corner. I’m going to get back to my karate schedule in a little better condition this month, and I hope to get back to blogging too! More soon! I am approaching the halfway point of my week-long vacation, so I decided to finally get going on a few guitar-building projects. The adventures began on Monday, when I ventured down to Denver to a place called Aspenleaf Millworks to get some of the guitar bodies that I had purchased resawn. For those unfamiliar: the guitar bodies that I purchased were 3 1/8″ thick. Les Paul bodies are 1 3/4″, so to maximize this expensive old-growth stock I wanted to find a place to cut these 14″ wide slabs along their thickness. This would yield me the Les Paul body stock that I wanted and an extra piece to use in a future project. I’m really grateful for Shane at Aspenleaf Millwork… I had called 15 different places to get someone to resaw this wood for me, since I lack a band saw and thickness planer or sander to accomodate this size of a blank. Everywhere else either didn’t have the capacity to do it, wouldn’t do wood that wasn’t theirs (what?) or wasn’t interested in helping me for such a small project. Shane not only helped me, but went above and beyond to do the job right at a very reasonable cost. I know where I’m going if I ever need this type of work done again. For anyone that needs custom molding or millwork done, give Shane a call and you won’t be sorry. That project is going to kick off in earnest later on this week. I spent today getting the first steps of my acoustic project off the ground. The first step was building a workboard and getting the neck and tailblock glued into position. It was my first experience working with hide glue (it sets up fast!) but I was able to get the pieces in the right location and clamped up. We’ll know if I was successful tomorrow when I unclamp things and see if it all stays together. I also realized why the professionals seem to have a form that they place their bent sides into, then use screwed cauls to apply pressure to the sides and to hold the blocks in place while gluing occurs. The hardest part of the process was fighting against the tension of the bent sides to position and anchor the tailblock in time to glue it. I used a combination of spring clamps and cam clamps (three on each block) to apply even pressure while the glue dries. With any sort of luck everything holds together when the clamps come off and I can move to applying the kerfing strips to the inside of the edges. My buddy Jeremy came over today and we started and finished a fun project. Jeremy’s hobby is recombining old audio equipment into a great sounding setup. On his own system, he got rid of a very expensive audiophile setup in favor of the results that he could produce himself. After he let me listen to his setup, I was very interested in understanding more about what he does. He prefers an open baffle setup, where full range speakers are mounted into a flat panel and modified to produce high end sound. 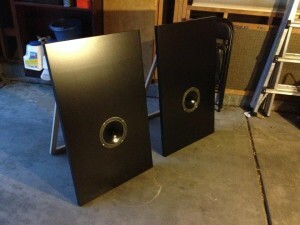 Several months ago, we headed to IKEA and picked up two VIKA AMON tabletops for around $10 apiece. Today, these tabletops got outfitted with some homemade backs similar to an easel back to stand them up. 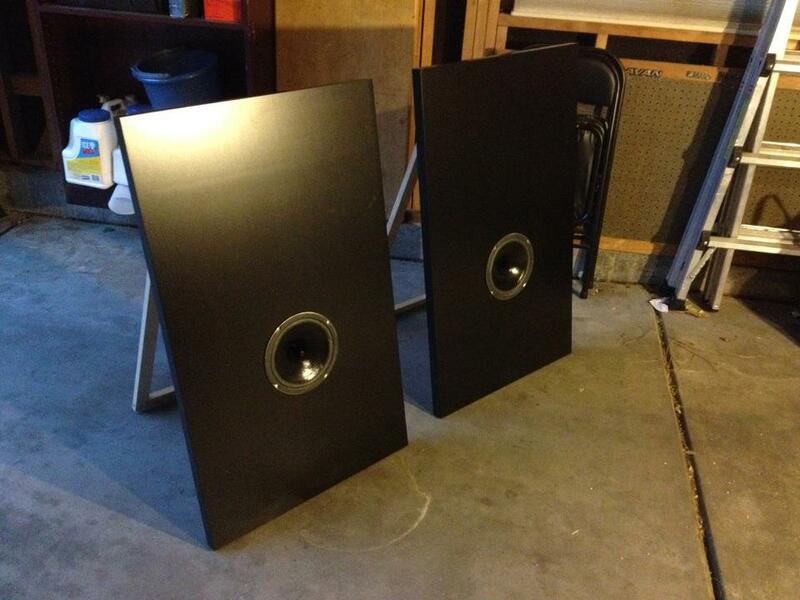 The modified speakers were mounted near the bottom for now, with plans to add tweeters and subwoofers later. The whole project took about $50 and 4 hours to put together from start to finish, and it turned out great! We did a test-run of the speaker setup and it’s great… the other benefit is that they stand up very flat and can be stored away… that’s important with the limited space and curious toddler situation that we’ve got going on right now. A few fun things… first, forstener bits are awesome. I got several of them and got to use them today. Second, the VIKA AMON tabletops are constructed interestingly (and ideally) for this project. They are made of around 1/16″ of hard formica-style surface on each side, and a weird heavy-duty corrugated cardboard honeycomb on the inside. That makes it light and easy to work with. Last, but certainly not least… it was fun to do a little side project. Now I’ve got a great new speaker setup for not much money, and I know a little more about how these tools work. This will help my guitarbuilding projects even more! I’ve been spending a lot of time lately reflecting about the various priorities that life brings. I don’t really have any epiphanies to report, but nonetheless I think it is wise to get my thoughts out onto digital paper so they stop rattling around in my head so much. For the first time in my entire adult life, I am putting God first. I have done more in the last 18 months to reintroduce myself to the Catholic faith than ever, and it feels GREAT. The catalyst for this change should be obvious to anyone that has looked at my Facebook feed in the last year: it was the birth of my daughter, Eve. I realized that if I was going to baptize and raise her as a Catholic, I should better know the proper things that I ought to be teaching her and be sure that I could answer questions from her as they arise (in the future, obviously). That led me to the That Man Is You! men’s fellowship, then to the Knights of Columbus, and then to my own personal studies in Catholic apologetics. I embarked upon all of the proceeding activities with three main goals: become a better man, be a better father for Eve, and be a better husband for Tasha. Skeptical? Good, so was I… when I went into the That Man Is You! introductory classes, I decided to go in with an open mind and left any baggage (and there was a LOT) at the door and actually strive to learn what the Catholic Church actually teaches instead of what I heard translated through people wronged in some way by the Church, by media, or by hearsay. I was pleased to find that the more I dug, the more I felt uplifted and empowered. I could go on and on with details (and I may someday) but I think a single quote by Archbishop Fulton Sheen about sums it up: “There are not more than 100 people in the world who truly hate the Catholic Church, but there are millions who hate what they perceive to be the Catholic Church.” The more I read the actual teachings of Christ and the Magisterium, the more the false perception drops away. That was a long windy paragraph, but I can continue on now… it won’t surprise you to know that necessarily my second main priority has been my family. I help put Eve to bed most every night, we have playtime together when I’m home from work, or at a minimum I help feed her dinner. Tasha and I are trying to get a little “no computer” time each night so we stay connected at a level that doesn’t involve picking up toys. She also participates in the Ladies Auxiliary, which operates alongside the Knights of Columbus (so we do Church activities together). We’re applying the above lessons from the Church directly to our family, and our family is getting better all the way to it’s core. This topic has often been used in a sarcastic tone in my immediate past, but the priorities toward God and family have put work in it’s rightful place. I still have to aggressively participate in my job when I’m at the office, but I take time in the morning to see Eve before I go, and so long as the sky isn’t falling I leave at a generally reasonable hour. It takes some effort, and occasionally things shift around so long nights are necessary but they are the exception now. There is some extracurricular work research that doesn’t get done now, but I’m finding ways to fit that in to my work day in creative ways. Another important addition is that I’m taking certain status meetings on the road, and I mean that literally: some of my coworkers and I discuss work status and actually take a walk along a running trail that goes around our office instead of sitting in the cube farm all day. It’s still important work, but it’s relaxing too. The time I’m not spending on the above activities has been divided among my other interests. Karate isn’t getting the focus that it used to, and I am somewhat conflicted about that. I do my best to attend class (and I really need to Facebook/blog when I do make it) but it hasn’t been aligning with my schedule in the best ways right now. I need to work on that. I know some of my karate compatriots back home are reading this and worrying to themselves (and possibly others) that I’m quitting or dropping out, and that’s just not the case. I still attend class, and I enjoy it when I do. The burner’s still on, but it’s set to LOW for a bit while I work on some other things. Eventually, I’ll put some tape on it and get over it. My other hobbies, such as reading and guitar playing/building do occupy some time, but it’s usually evenings or the spare weekend day. I am going to make some weekend time for getting started on my guitarbuilding hobby, so expect to see some entertaining posts in the Recreation category. None, really. The reason I committed all this to the blog is to acknowledge efforts toward closing some deficiencies and to reflect on the positive changes this has made on my life. These changes have been working for me right now, and I intend to continue with them. Things are going along pretty normally right now around the house. Much of my time has been focused on work and church-related activities, which is a nice refreshing rebalance of my priorities. I am learning to leave stress at work when I go each day, and using the rest of my time to focus on my family and helping others. Unfortunately, due to a fairly demanding Lenten season of church activities, I have not made it to the dojo as much as I would like. This week is my anniversary and my next-to-last week of That Man Is You on Friday morning, but after that I hope to make a few workouts before the end of the month. Eve is getting much bigger and more active. She finally broke her cycle of hovering near the statistical bottom of the weight chart, and is just on the verge of learning how to walk. She had a minor meltdown at church today, those are usually very rare and far between. We think it was a combination of being too tired and some diaper rash that she’s picked up over the last few days. Or teething. It could also be teething. Speaking for a moment about my 2012 goals… my book-reading goal has been struck with some attention-deficit disorder. I have several books underway, opting to read a few pages each night. One is close to being completed now, and before long I will have strong motivation to finish my guitarbuilding books since I will be starting on a few of those projects as soon as the warm weather is consistent. The short of it: expect to see some progress soon. I am trying to get into the habit of blogging again, but honestly participating in life is taking the place of actually writing about it. Please excuse any long expanse of whitespace here, know that I’m out in the world doing interesting things and I will eventually return here to write about them as time allows. It is often much more convenient to use social media (such as Facebook, Twitter, etc) to provide a day-to-day view of what I’m doing. More soon! As some of you may know, I am participating in the That Man Is You! men’s fellowship at Church. This is the season of Lent, and the program challenges us to attempt a different covenant each week. This week, we are challenged with something that will be very difficult: no media. The idea is simple: the world is noisy and attention grabbing, and forces us to not spend our attention on the things that really matter. So this week Tasha and I are going to spend our time reading more, praying more, reflecting more, and spending more time with family and friends. I am going to completely remove TV and limit myself to only an hour of Internet time each day (outside of work, obviously). Interestingly, one of our local grade schools is doing Screen Free Week this week so our neighborhood will be experiencing a general trend of less TV and Internet use. So don’t be alarmed if you don’t see me online. If something is important, please call my phone or text me. Goal 1: Save 3-6 months in an emergency fund. Task 2: Get taxes prepared (hope for a refund!) and save $500 more this month. Task 3: While waiting for the tax return to hit, budget aggressively and put a set amount in the emergency fund each month. Onward to the Reading goal! Goal 3: Read more books, targeting 10 non-fiction books for the year. Tonight I finished a book by Joan Carroll Cruz called “Eucharistic Miracles“. Like the title indicates, this is a collection of history surrounding the many miracles attributed to the holy Eucharist. This book was pretty dense, since most of the chapters were only a few pages long and each story was unique and interesting. I found out about this book from a guy in my That Man Is You! group, who was reading it himself. I would strongly recommend this to any of my Catholic friends and family. If you’re interested to find out more about the book let me know. I got a lot out of reading it, and it compelled me to volunteer to help with the Eucharistic Ministry at my Church. I’m only going to give myself half credit for this book since I technically started it last year. Task 3: Finish reading Ervin Somogyi’s ‘The Responsive Guitar’ for half-credit. This week has already been quite busy. My development partner is out of town attending his grandmother’s funeral, so I got today experiencing the rare pleasure of coding all day long. I have a day punctuated with a few meetings tomorrow, but it should be more of the same. In fact, the rest of the week proves to be more of the same but my pair will return on Thursday so we can partner up to finish the rest of the project. As nice as it is to be coding, the change that I am referring to is more exciting. Providing all the final plans go well, next week I will be travelling to Switzerland and Austria for work. I’m excited about this because I have never been outside the country, but nervous for this very same reason. It will be an exciting adventure, however the run-up to this trip means that I will be spending some late nights coding and then I will be away for a week. That’s about two weeks being at least somewhat absent from Tasha and Eve, which is tough as well. The fun parts: I will get to see an ocean. I will get (and then loathe) international plane rides. I will get to see the inside of European office buildings. I might even get to see a sight or two while we’re there. I wish there was a way that Tasha and Eve could come along! I’m happy to report that I successfully achieved my first money task of the new year! Task 1: Survive until February, sticking to the budget and conserving money where possible. Since it’s February 1, this task is complete! We even ended up with about $400 left over in our emergency fund. I’m happy to report that the new water heater is continuing to produce hot water, so the money was well spent. I’ve looked back at our budgets for the last few years (yes, I keep them… pretty sick, I know) and our budgets remain pretty slim through the first quarter. I suspect that is going to happen again this year, as we have budgeted for tax preparation and Teddy needs a phenobarbitol levels test too. I am DONE with my final debt, my Sallie Mae Student Loan. Onward to the Big Emergency Fund! John Kraft in Band Saw'd! 2005 Workout #104: I’ll take Erbe and Dalcher for the win!